As studied in quite a few other posts, I’m getting a lot of annoying random stops, but have found no solution thus far. The core is on a Qnap TS251+ NAS with Quad-core 64-bit Celeron CPU and 8GB RAM, the NAS is used as basic file storage so is under no strain whatsoever - I’ve never seen the CPU go above 42%. I stream content successfully from the NAS every day with no interruptions including 1080p video. I do not stream any third party services, just my 804 FLAC albums. It is not a particularly busy network. I really do not want to move the core. It’s a Netgear R7000 Nighthawk Router in router mode, with ‘enable smart connect’ unchecked, as recommended by these pages. All Controls are on fixed IP devices. The Core is accessed by two Android Smartphones and an Android Tablet, plus three Windows controls via a mix of wireless, Ethernet wired and Powerline connections. Endpoints are a mix of Airplay, Chromecast singles and groups, some DACs plus local direct connections. I’ve been monitoring for long enough (four months) to establish there is no obvious cause or common denominator, as the stops occur in any and all combinations of the above. Sometimes it just freezes, sometimes it stutters for a few seconds and freezes, sometimes it goes straight to ‘lost connection’, sometimes it reconnects successfully sometimes it doesn’t. Often all the endpoints except Airplay disappear from the list until re-connection is established. This afternoon it lost connection four times in twenty minutes, the longest it has lasted without interruption is six hours, getting to an hour is unusual. Logs seem to just confirm that ‘client disconnected’, but obviously there’s a lot in there I can’t decipher. While I understand that you wish to use your NAS as the Core machine, it does fall below our recommended specs. The issues you’re experiencing can definitely stem from an underpowered Core machine, so it’s something to keep in mind as we troubleshoot. The best way to confirm whether or not this behavior may be stemming from your Core is to try using a Core machine that meets our requirements and compare the performance. Are you using any other networking hardware (switches, EoP, etc.)? Hi Dylan, thanks for the prompt response. There is a switch involved but I’ve eliminated it from my inquiries. I have also been checking the NAS CPU Resource Monitor and it maintains a very low percentage at all times. I’m slightly confused as to how the Core machine can be ‘under powered’ and therefore responsible, when it’s operating at less than 30% load at the time of the crash. I understand that Roon makes demands very dynamically but I can honestly say I’ve never seen it peak at more than 50%. Perhaps it peaks too high and too fast for the Resource Monitor to pick up? Either way I do not have a suitable alternative home for the core and cannot justify replacing the NAS. I’ve just finished a large number of tweaks and edits (I’m talking days), this is very disappointing. Any further advice to minimise the issue would be much appreciated. If you play directly to one of your remotes does the same behavior occur? Are you using DSP at all? 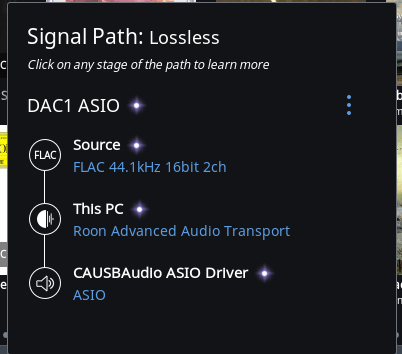 Can you share a screenshot of the signal path when playing to one of your devices? Hi again Dylan, thank you for your help with this. <<If you play directly to one of your remotes does the same behavior occur? Yes, Android phone stopped within twenty minutes, Android tablet has been going for ten hours now with no stops. <<Are you using DSP at all? I’ve given the NAS some work to do while live monitoring the CPU via my phone. With Roon running, two backups to HDD, a big download and streaming a 1080p movie it hasn’t peaked over 48%. Since this behavior occurs regardless of the endpoint you’re paying back to, it definitely sounds like there are performance issues impacting your playback experience. When this type of behavior occurs it typically stems from one of two things — Core performance or networking performance. You’ve already mentioned that you’ve simplified the network by removing switches from the equation and connecting the Core directly to the router via Ethernet, so the network sounds like it should be okay. I spoke with the technical team about this and they agree that the next step here should be trying to use Roon on a machine that meets our requirements. Even if the machine is not something you want to use permanently as your Core, knowing how things behave when the Core meets our requirements will be a great help in fully understanding the issue you’re experiencing. Fair enough, under the circumstances I can’t argue with that I’ll see if I can borrow something. FYI I have managed to be staring at the NAS CPU resource monitor at the precise moment Roon stopped - CPU was at 8% with RAM at 26%. You’ll understand why I find it hard to believe that an under-powered processor is the culprit? In the meantime, are there any other avenues I can follow? I’ve moved the core to an i7 NUC with 16 GB of RAM. Roon has now stopped (lost connection) running from a phone (wireless obviously), a PC (over Powerline) and a laptop (ethernet-wired directly into the R7000 router). Tests thus far with the NUC core have all been Chromecast end points, so networking could be an issue, I’ll do more tests with local end points. Watch this space. I’ve made time to repeat all the tests done when the core was on the NAS, but with the core now on the NUC. All end points local and remote, switches in and switches out, Ethernet, wireless and powerline connections. The random stops continue under all circumstances, including Roon running on the NUC (core) machine with Ethernet connecting to the router/NAS (FLAC folder), no switch. Since this behavior occurs on the new Core, even when connected to the router directly, I’d like to take a look at some of the specific settings on the router. Can you share some screenshots of the settings on the router? Do you have “Smart Connect” enabled? If so, can you try disabling this setting? Since smart connect selects the best WiFi band 2.4 GHz or 5 GHz for WiFi connections this could surely only speak to wi-fi issues? 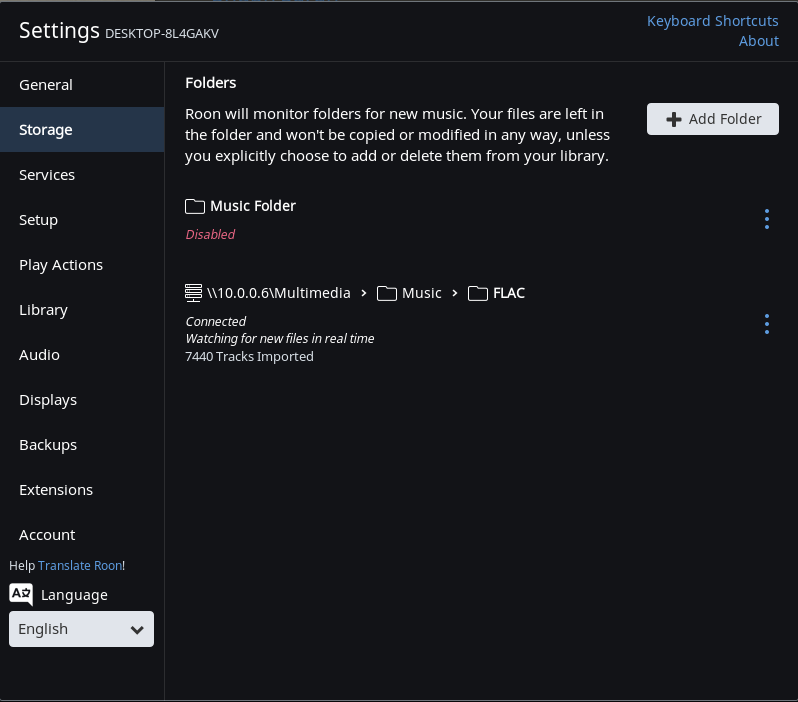 I realise that Roon utilises a unique architecture, but I have streamed the same FLAC folder from VLC to Chromecast all day with no stops, I stream 1080p video from the same NAS every evening with no stops, I experience no networking issues whatsoever with my current router/setup. <<Can you share some screenshots of the settings on the router? There are seven drop-down menus under the ‘Basic’ tab on my router and six under the ‘advanced’ tab. Which settings are most likely to be Roon specific? Thank you for confirming the setting is still unchecked here. Moving forward, I’d like to enable diagnostics on your account. The next time this behavior occurs please make a note of the time. Respond here with that timestamp and your timezone and then I’ll enable diagnostics. Stoppage occurred at 1513 today March 8th. I’m very keen to get Roon operational because I really like it so I’m going to report anything and everything it does outwith normal parameters in the hope that you will be able to drill down to the cause of the problem. It just failed to find a new album copied to the (only) music folder it looks at, I had to Force Rescan. So folder monitoring in real time is no longer functioning, I haven’t been tweaking. Storage(path)/Edit/Save successfully forces a quick rescan. I wanted to reach out because I’ve been keeping an eye on our servers, waiting for the aforementioned diagnostics report. For some reason it is not reaching our servers, even after I tried re-enabling diagnostics on your account. I also ran a quick test and I was able to submit a similar report from my setup here, so something else is going on. Can you share a screenshot of Settings > Storage? I had a chat with the team about this and sent them over the logs. The team has proposed a test that will give us some greater detail about where this behavior is coming from. For real-time monitoring, we rely on information being sent over the network from the storage location. If this information isn’t reaching the Core machine, Roon isn’t able to always properly pick up when new files are added. This, plus the playback stoppages, seem to point to the same thing — There is something causing a connection issue between your Core machine and the QNAP. Temporarily move a subset of your files so that they are locally connected to the Core, whether this is an internal drive or a USB connected drive. Add this local watched folder and test to see if these same playback stoppages occur.